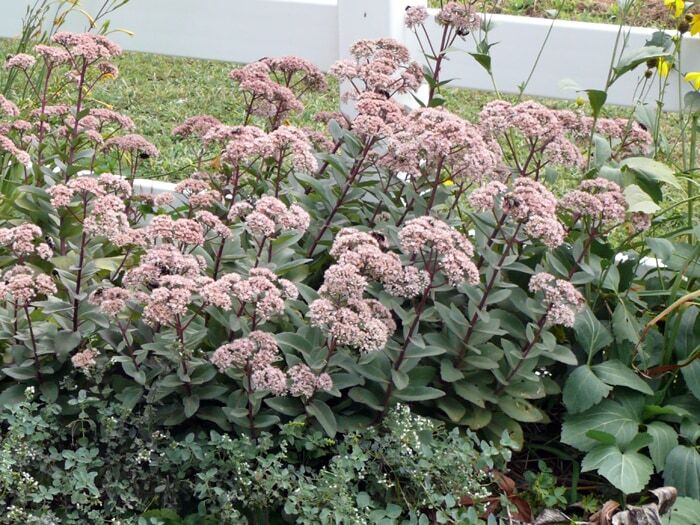 One of the easiest plants to grow, Sedums don’t require a lot of water and they like sun. Their major soil requirement is to have it well drained. The show starts in late August. This is Autumn Joy with Artemesia and Helianthus. They come into their own starting in August. Once you see their display and the interest they add in late summer and early fall, you’ll never want to be without them. And you don’t have to be— because they are also one of the easiest plants to propagate. Once you get your first plant going, with a few minutes of attention in the spring, you’ll have all the free sedums you want in years to come. Just break off a stem and push into the ground. They root easily. The show continues with Autumn Joy in mid-October. Autumn Joy is dramatic with mums as it deepens in color in late October. 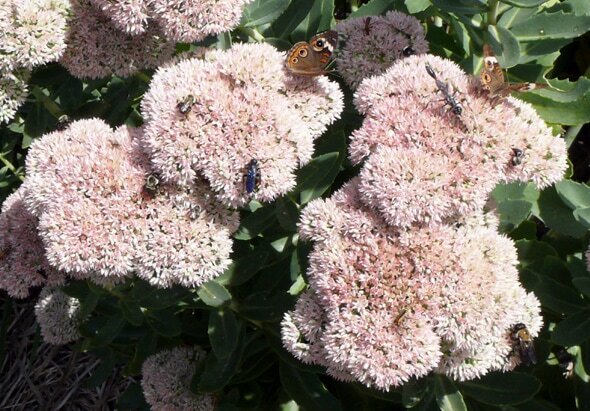 Sedums are beneficial as well as beautiful since they supply food for our pollinators, the bees and butterflies. In my borders I can hear the hum of hundreds of bees as they work the sedums. I had one visitor ask me if I put all those butterflies on the plants. They weren’t moving very much, so I guess she thought they were artificial. A variety of creatures sharing Autumn Joy flower-heads in early September. As if that weren’t enough, they’re covered with “hover” flies when in bloom. Hover flies are good guys that eat aphids most of the time and feed on the pollen of sedum and other pollen-rich flowers when aphids are not on the menu. Plant sedum around your garden to keep these “good guys” resident, so they’ll be there to eat the aphids when and if they appear. Even after the cold weather turns the flower heads brown, they provide a nice spot of interest during the winter. Showing the proper posture for Sedum Autumn Joy. This group will be nice winter interest for this border. 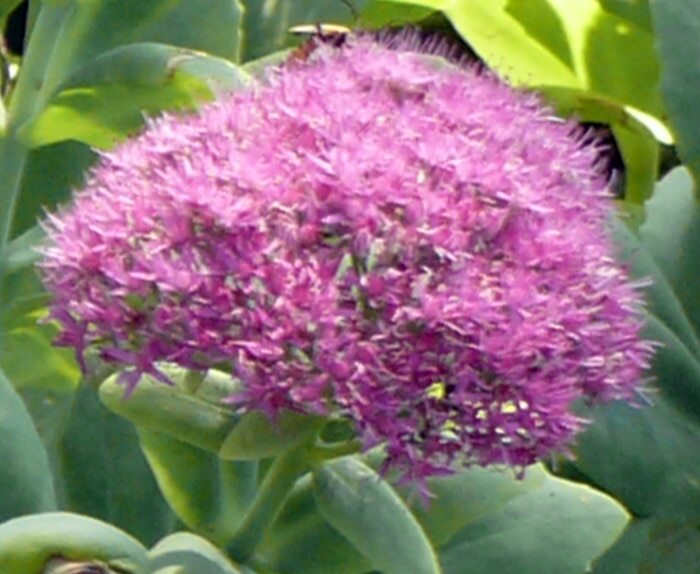 The common name for sedums use to be “Stonecrop”. 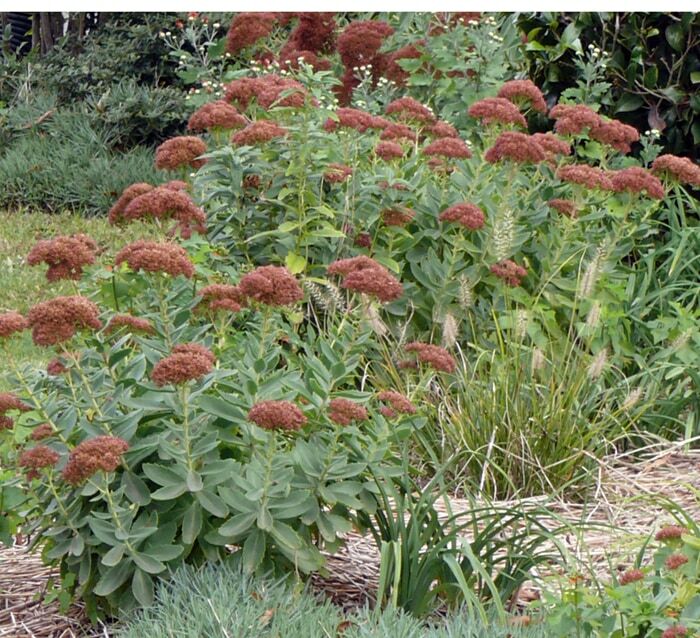 But after Sedum “Autumn Joy” appeared on the scene the common name has become sedum for the majority of people. 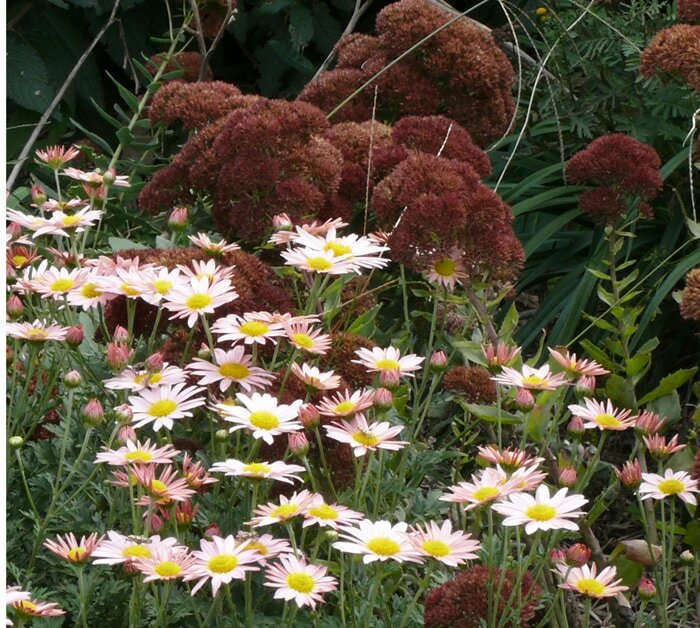 Autumn Joy is without doubt one of the most popular perennials of all times. The strong 24 inch stems (sometimes taller) are topped with flower heads that change color from pale pink to rose to rusty red as they mature. Autumn Joy with Helianthus the first week in September. It has gone from green to pale pink to rose. Viewing the borders in mass is spectacular. If we have lots of rain in the spring, Autumn Joy in my borders tends to start getting taller than I think they should. (I suspect its because I have very fertile soil.) Most of the time I cut them back so they won’t get so lanky that they fall outward and show the center. Autumn Joy got too tall here and fell over. Not the ideal, but still makes a show. Rust colored late September Autumn Joy and Artemesia. Medium to Tall (2 1/2′). 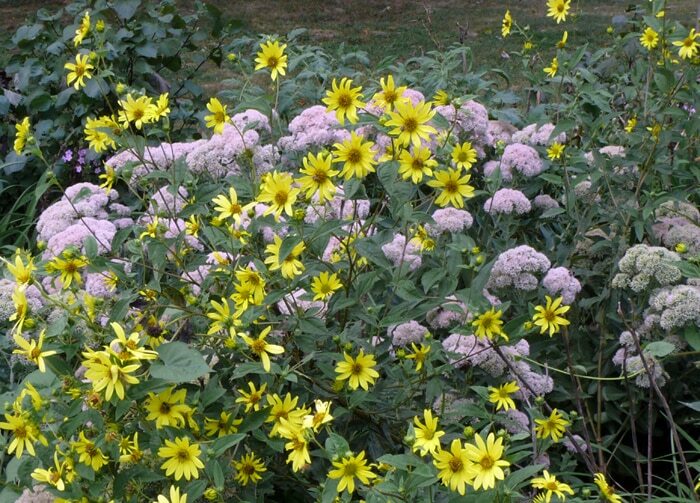 Robust pale pink flowers are borne on ebony red stems. 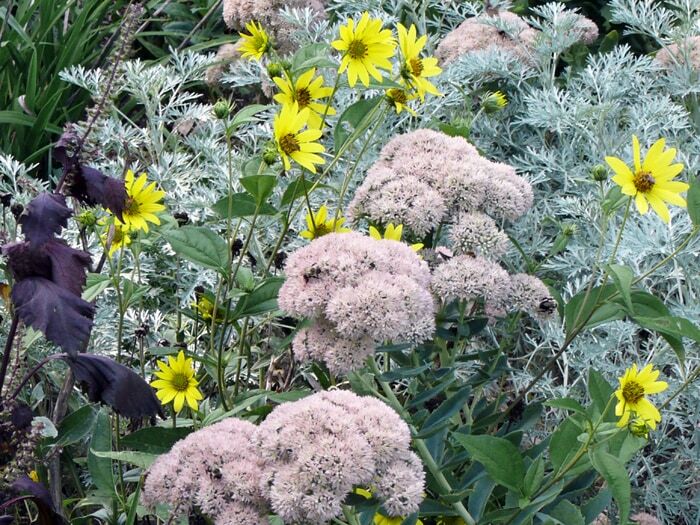 A strongly upright grower with deep gray green foliage and contrasting stems makes it a welcomed addition to any border. So excellent with grasses and asters! 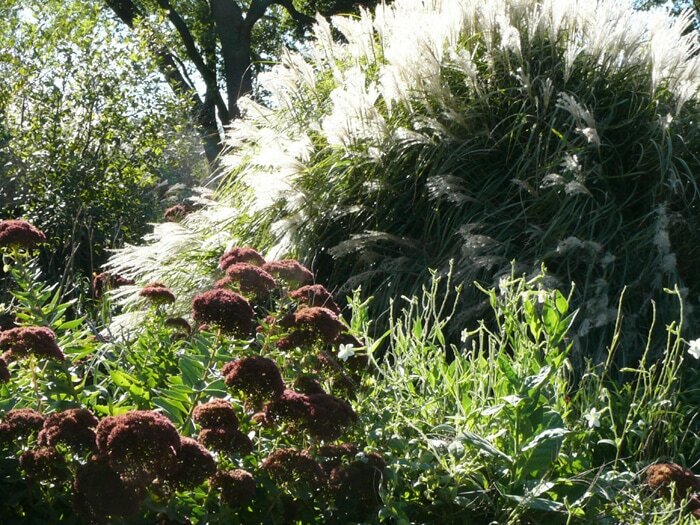 The upright posture of Matrona and its dark stem color makes it a striking accompaniment for other perennials. Close up of Sedum Matrona in early September. The brilliant rose-pink color of the heads and the fact that they are brilliant pink after Autumn Joy and others have turned deep rust in late September, gives this sedum its front and center position in my border. Very noticeable especially once the other sedums are deeping in color. Neon is the right name. I plan to start more next spring. 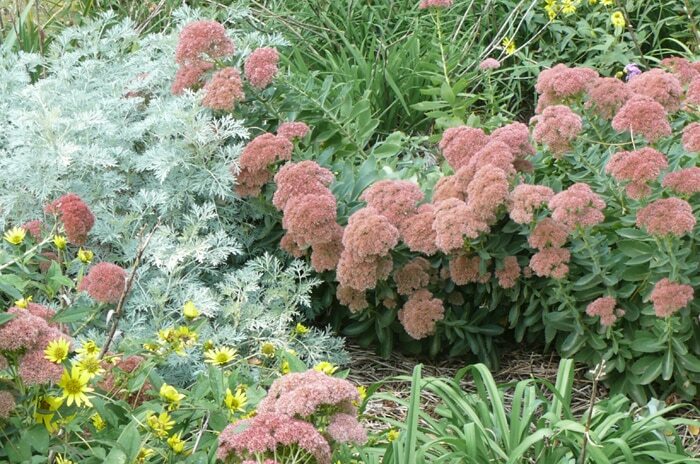 The flower heads of Sedum Neon are still brilliant rose in late September when Autumn Joy and Matrona are deep rust color. Sedums make great cut flowers. And although they do not retain their color – but rather – turn some shade of brown or rust – their dried heads are especially nice for fall wreaths. I plan to add a recent introduction called Sedum Purple Emperor. The pictures I’ve seen of its rich dark purple-black leaves and stems topped with dusky pink 5-6″ flower heads are very appealing. This award winning variety is a striking combination of foliage and bloom! Said to be 15″ tall and upright which are two desirable characteristics that I was looking for. 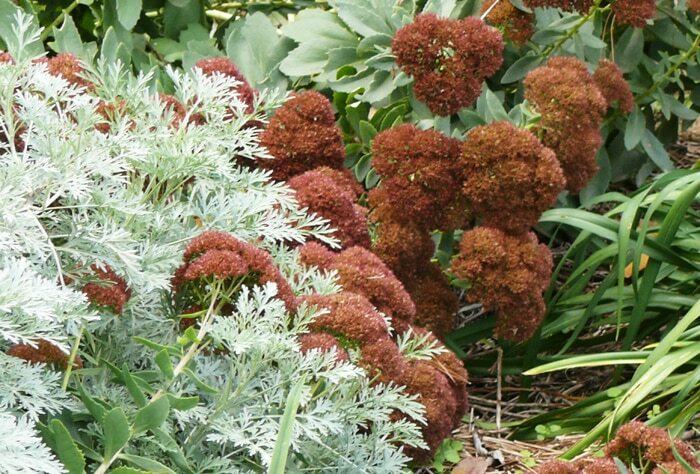 If you don’t already have sedum to brighten your late summer and fall garden – plan to try it. If you already have some — plant a new variety. 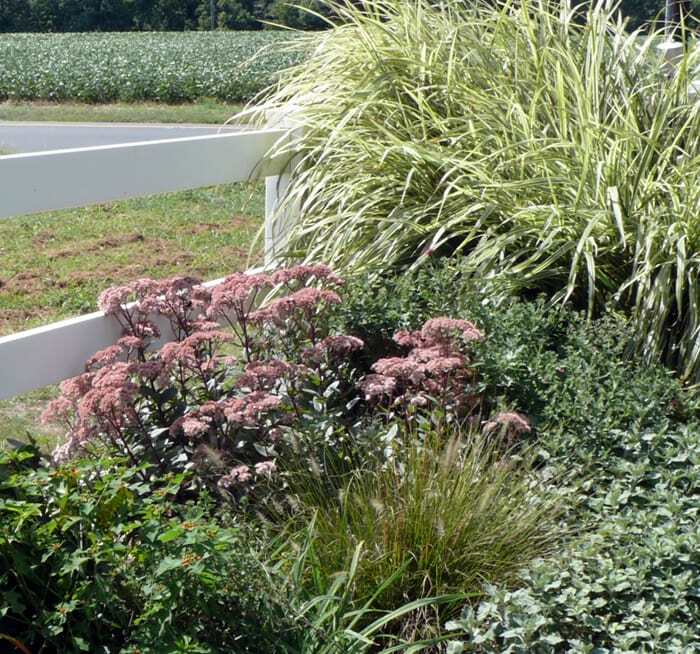 It can add another dimension to your perennial border. 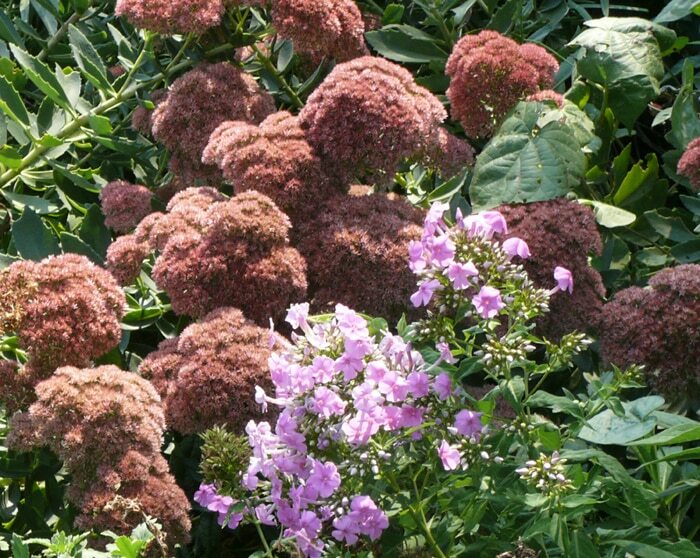 Late September Sedum Autumn Joy with pink phlox.